Range of flavours - sufficient to suit everyone. Grown as canes. Will reach several feet in length and will need to be supported on a trellis or with a post and wire system. if you are planting in an open windy area, make sure that canes are well tied in or they could be badly damaged during winter gales. 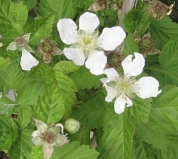 Modern varieties (many thornless) are less vigorous than the wild bramble but can still be fairly rampant. Will still be producing after 20 years. Not a picky plant, likes full sun but copes with some shade and poorly drained soil. Does not like lime. Frost can damage tips of plants. Plant canes in November-December (preferably) or March. Container-grown canes can be planted at any time when conditions (weather, soil etc.) are suitable. Soil should be prepared about a month before planting. Remove all weeds from a circle of soil (diameter of about 3'-4'). Remove about 1' of soil, add compost and fork in then replace the soil. If planting in rows, leave 6' between plants and 12' between rows. When planting dig hole, 3"-4" deep, and wide enough to take roots spread out, cover with soil and tread in gently. Water well. Pruning is vital because fruit is produced on the previous year's shoots (new canes). Old canes must be pruned out to ground level in autumn after harvesting to encourage the new shoots. Prune back any dead tips of canes in spring. Remember to wear gloves when pruning if your canes are not thornless - some of these plants seem to prefer fresh blood as fertiliser! Some thornless varieties can produce thorns after a few years. Weeding (take care - roots are shallow - better to pull rather than hoe), mulching and feeding are important. Water soil (not plant) well during dry spells. Raspberry Beetle: attacks the blossom. Birds: Most gardening books suggest that birds are not a particular problem with these berries. Unfortunately the birds in Wem have not read the books, particularly the blackbirds and thrushes - you will need to net as the berries ripen. Hybrids: Some are well-established and useful, others could be better described as 'niche berries'. Tayberry: thorny, not over vigorous; large, red berry which is sweet with flavour. Doesn't cope with very cold winters but worth thinking about. Loganberry: new varieties are less thorny and vigorous; berry is red and long, taste is sharp without the depth of the bramble. Boysenberry: looks like an elongated raspberry, thorny and fairly vigorous; can cope with sandy soils and drought. Hildaberry flowers Hildaberry: Tayberry x Boysenberry. Very vigorous producing robust and very thorny canes, better trained along trellis or fence like a bramble. Could be used as a food-producing intruder deterrent. Has very large dark red berries that resemble brambles, can be eaten fresh or used for cooking. Taste is more complex than the parent plants, has elements of stone fruits. Large white flowers (2" in diameter), harvest - July to early September. Has proved a heavy cropper producing a well-flavoured fruit whether eaten raw or cooked. Wineberry: not a berry but a currant, covered with small thorns, attractive bush, berries are small, red and sweet but have no particular flavour. Can be found growing wild as bushes, hedges or small trees and is easy to cultivate. Flowers are heavily scented, tiny and white growing in large, flat, plate-like clusters. They can be used to produce tea, cordial or wine. Small black fruits are produced in autumn that can be used in preserves or made into wine. All parts of the plant are regarded as toxic. Cooking processes will neutralise the toxicity of the flowers and berries. 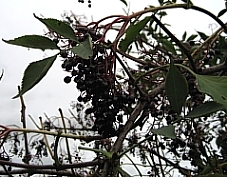 Individual responses to raw elderberries varies. Some people can ingest a few with no apparent ill effects whereas just the smell of crushed berries will cause nausea and sickness in more sensitive individuals. Better to avoid experimentation with raw berries and flowers. Will tolerate most soils and cope well with clay, loam or sand. Soils can be mildly acid, neutral or mildly alkaline, seems to thrive best between pH5.5 to pH6.5. Prepare soil by digging in compost if planting fresh canes. Bare-rooted canes are best planted in November or March. The roots don't like to be waterlogged but tolerant of most other conditions. Roots are fairly shallow so care needs to be exercised in drought conditions. Caution is needed when weeding around the bushes, vigorous digging could damage roots. Most gardeners allow elderberries, particularly those in hedgerows, to 'run wild' and just remove dead or broken branches. It is sensible to restrict the height of the bushes if a crop is to be harvested. Elderberries suffer from few pests. Fruit is harvested August/September. Pick each cluster of berries and 'strig' individual berries later. This is best done by 'combing' through the clusters with a fork. Make sure that surrounding areas are protected. Stains produced by the juice are difficult to remove.